The school session commences in April and ends in March. Registration forms are available at the school office with effect from November each year. The Play Group, Nursery, K.G children seeking admission will be interviewed by the Principal before admission. While children seeking admission for Class I and above will have to appear for a written test. Candidates will be selected on the basis of their performance in the written test as well as interview with the Principal. Admission forms must be duly filled out clearly and brought on the day of interview/admission test. A photocopy of the Birth Certificate along with original and transfer certificate along with recent photographs of the child and parents must be attached in the admission form. The selected candidates must abide by the rules and norms laid down by the school. The academic session of the school is from April to March. The school remains open from Monday to Friday and is closed on Saturday, Sunday and other holidays unless specified. 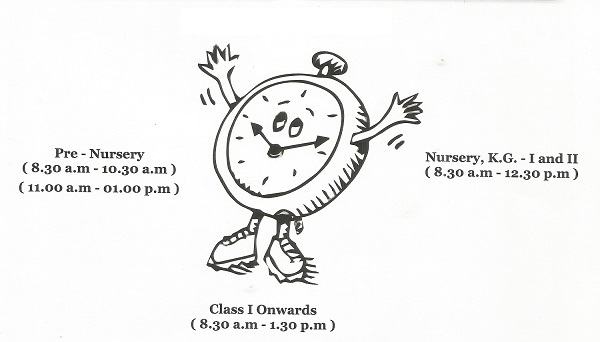 Pre-nursery: 08.30 a.m. to 10.30 a.m. / 11.00 a.m. to 01.00 p.m.
Nursery, L.K.G, U.K.G: 08.30 a.m. to 12.30 p.m.
Class I to III: 08.30 a.m. to 01.10 p.m.
School reserves the right to change the school timings if and when necessary.